Find real parts, improve the reliability of your designs, and reign in BOM costs with advanced circuit and component analysis tools so you can choose the right part for your design needs. The repetitive nature of BGA and other high pin-count device fanouts is perfect for time saving automation to make you more productive. Define constraints directly from simulation results to optimize design requirements for your unique design needs. Simple, spreadsheet-based interface makes it easy to enter and manage constraints throughout the design process. 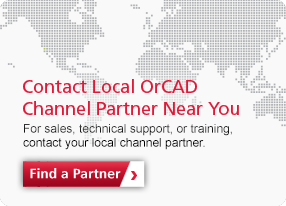 Here we explore OrCAD PCB Professional. The suite contains Capture, PCB Editor, SigXplorer, STEP 3D engine, Design Re-use and much more.